Both Amir Hall and Trenton Cannon have made strong cases for CIAA Offensive Player of The Year and national honors. The CIAA has always been a league known for exciting, high scoring football players, but this season it has been home to arguably the two biggest playmakers in HBCU football. Bowie State quarterback Amir Hall and Virginia State running back Trenton Cannon entered the season as All-America type players (both were our top players at the QB and RB positions this summer in the CIAA) and both lived up to the hype from start to finish. Week-after-week these two thrilled crowds and frustrated offensive coordinators as they led their respective teams to nine wins each in the regular season. The question is, who is the CIAA Offensive Player of The Year? Cannon entered the 2017 season on fire after a junior campaign the previous year that saw him rush for better than 1,200 yards and go over 200 all-purpose yards in four of his last five games. He picked up right where he left off in the season opener against Norfolk State, rushing for 145 yards against the D1 defense and helping lead VSU to its first win over its former CIAA rival since 2005. The Hampton native consistently put up big numbers, not only on the ground but also in the receiving and return game. He rushed for better than 100 yards in every game except for one and went over 200 all-purpose yards in seven of his team’s nine games heading into the CIAA title game. Highlights include his 272 all-purpose yards and two touchdowns, including the game-winner, vs. WSSU, and back-to-back 200 rushing, 300-yard all-purpose games against Bowie State and Lincoln in which he averaged 12 and 23 yards per rush. Cannon finished the regular season with 1,387 rushing yards and 14 touchdowns. His touchdown number could have been higher, but VSU quarterback Corderal Cook had 17 touchdowns himself, many of them coming after long Cannon runs. In short, Cannon was an unstoppable weapon that VSU used to bludgeon the rest of the CIAA into submission all year. Like Cannon, Hall entered this season with big expectations. After setting the conference’s single-season passing record his first season on the field, the Bowie, MD native entered the season as the focal point of every defense he came across. Hall came out on fire to start the season as well, completing 89 percent of his passes for 361 yards and contributing six touchdowns in a 48-7 win over Seton Hill. His Twitter/Instagram handle “@_Goodfor6” proved to be true all season in 2017, as he accounted for at least six touchdowns in four of his team’s 10 regular season games and he accounted for 270 points in 10 games, 30 points more than any one player in Division II and more than 10 teams in the CIAA. His regular season totals are staggering: 3,187 yards (3rd in the nation), 39 touchdowns (best in the nation) while completing a blazing 67 percent of his passes and throwing just four interceptions in 321 pass attempts while leading the nation’s top offense. Elections took place across the United States on Tuesday, and voters for the CIAA awards have a tough decision to make regarding the offensive player of the year. The truth is, they really can’t go wrong with either player. So Co-Offensive Player of The Year might be more fitting. But there is another award both should be in the competition for as well. Hall and Cannon are both among dozens of nominees for the Deacon Jones Trophy, the award given to the top player in HBCU football by the Black College Football Hall of Fame. In the award’s first year, all four of the finalists sent to Atlanta hailed from the FCS level, two from the MEAC in North Carolina A&T’s Tarik Cohen (who won) and North Carolina Central’s Malcolm Bell, along with Grambling’s DeVante Kincade and Southern’s Lenard Tillery from the SWAC. Finalists have yet to be announced and I don’t have a vote, but if Cannon or Hall are not both in the top five, one would have to question whether or not its possible for a D2 player to actually be considered for the award. 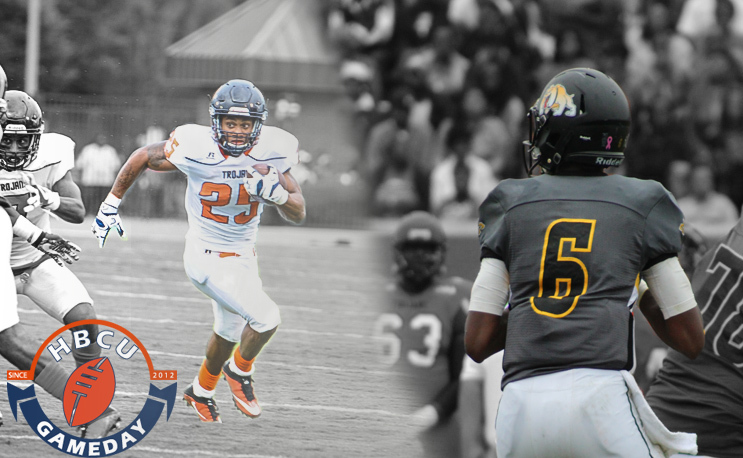 Both players have made the CIAA must-see football for the first time in a while and both should be rewarded. The real winner, here, is the fans.